Herd certification is loosely defined on this web page as any official program designed to classify herds according to the probability that individual goats in those herds are infected with Mycobacterium avium subspecies paratuberculosis (MAP). Provide a simple system to communicate to goat buyers the risk of buying a MAP-infected animal. Stop the spread of this infection to non-infected herds. Herd certification is the foundation of paratuberculosis prevention. Johne’s disease should be considered a herd health problem, not just an individual animal disease. 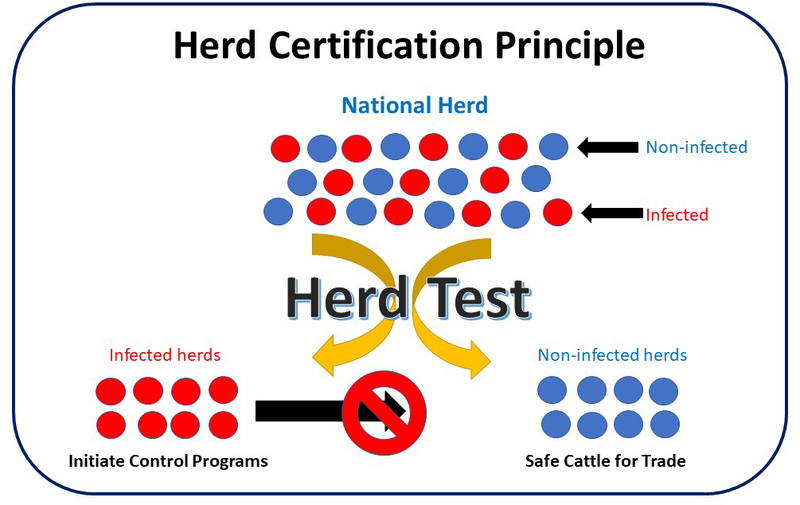 Certification programs apply laboratory tests to classify herds by levels of infection ranging from not infected at all to very likely infected. Often such programs have regulations that participating herd owners must follow regarding the sources for replacement cattle. These rules are designed to help herd owners avoid bringing MAP-infected goats into their herds without compromising their ability to do business. The schematic diagram above illustrate these two basic concepts: 1) apply a herd test to sort the herds and 2) prevent movement of infected goats into the non-infected herds. Of course, this works best if all herds participate and is only achievable with one application of a test to all herds if the test was perfect. Lacking perfect tests, we must repeat testing annually. NOTE: In this graphic, the term “national herd” does not have to represent all the goat herds in a country. It can just as easily represent all of the herds in a specific locale or of a specific breed. Breed associations can adopt these same principles to stop the ongoing spread of Johne’s disease among their elite breeders: it’s the right thing to do for the health and welfare of their animals and their organization. Check out the Beef/Certification page of this site to see an examples of a sound certification / herd classification program designed for U.S. cattle. Follow this link to see the extensive program designed for goats in Australia. "Certification" programs for goat herds are rare. The principles, however, are the same as for cattle. Certification programs do not have to be operated by governments. Breed organizations should consider developing their own. Australia has one of the most comprehensive systems.